Thank you for your interest in Hollywood Kitty Company. We specialize in the design and production of top-quality custom cat furniture. Our goal is to provide you with a wide variety of furniture products to choose from, with as many customizing options as possible. Our products come in many types, styles, shapes, and sizes. With over 150 designs, there's sure to be something for everyone. However, if you'd like to design your own cat furniture, or have us to design it for you, let us know. Chances are, we can build it! Our state-of-the-art design techniques, such as 3-D computer modeling & animation, can allow you to see your ideas come to life, before they are actually built! Hollywood Kitty Company was founded in 2003, in Los Angeles, California. However, our beginning can be traced back to the early 90's, when we began as a small custom rug shop in Cleveland, Ohio. In 1992, founder, Kenneth Yuzva started a company called "Carpet Creations", after teaching himself how to make custom rugs, carpet tapestries, auto mats, & carpet bed-liners for sport trucks. 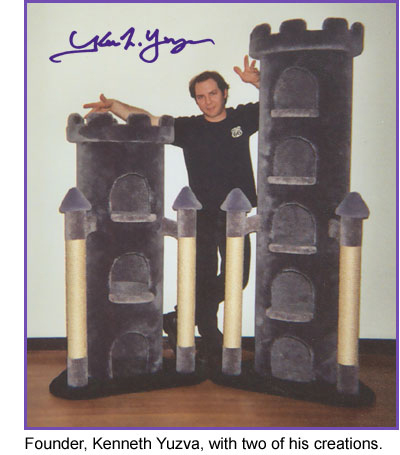 With his skills as a custom rug maker, combined with his love for cats and a background as a graphic artist, making the switch to designing and building custom cat furniture was the purr-fect thing to do! "I went to a pet store for some bird food", explains Ken. "While looking around, I noticed some cat trees. Since I've worked with carpet for so long, I was curious to see how well they were made. It seemed like whoever made them didn't know much about working with carpet. Plus, the materials they used were not very good quality. On top of that, I thought the designs were boring and unappealing. I started thinking about how I would have made them. I knew that I could do a much better job. At that moment, I had a great idea. What if I designed some cat trees that were artistic, interesting, and high quality? So, I set out to create a series of cat furniture designs that cat owners would actually enjoy having in their homes!" For the next year, working with a 3-D computer program, Ken developed a plethora of designs that are both practical and interesting - not just for cats, but for cat owners, as well.